ERASING SHIELD Fine gauge stainless steel. 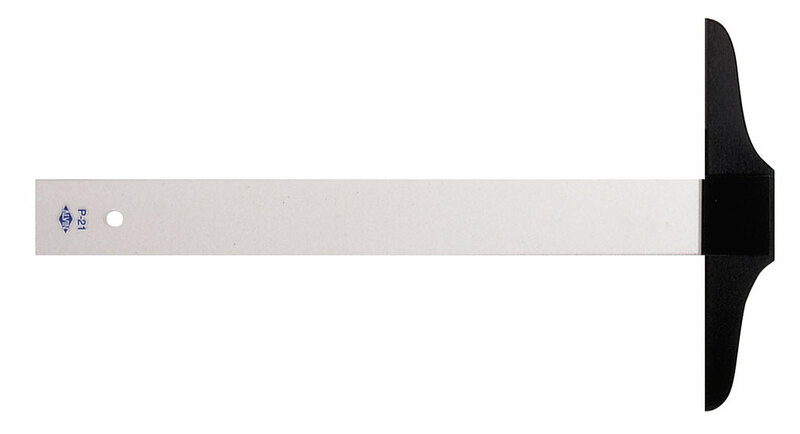 SANDPAPER POINTER Fine honing or pointing of drawing pencils and leads. REGULAR DUSTING BRUSH 15" long. Soft sterilized horse hair. Clear Acrylic Plastic. .08" thick. (45/90-8" and 30/60-10" degrees) with 16ths of an inch graduations on two edges.Raised inking edge prevents smudging. Cut-out finger lifts. COMPUTING TRIG-SCALE ADJUSTABLE TRIANGLES Rise and slope graduations. Inking dges on all three sides. Hot-stamped graduations. Thumbscrew locks triangle securely at desired angle. 0.12" thick, light blue, optically clear acrylic. Detailed instructions included. 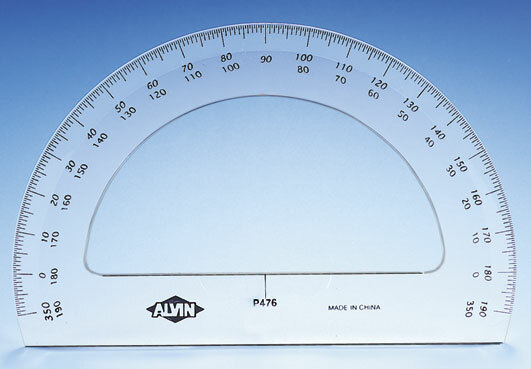 Provides the features of a 45/90 degrees adjustable triangle plus those of a protractor. Angles from 0 to 90 degrees can be drawn from the baseline with 1/2 degree accuracy. Die engraved graduations for high visibility. The aluminum thumbscrew securely holds the selected angle and allows quick pickup and manipulation. Made of high impact acrylic that is 0.100" thick and optically clear to eliminate parallax and allow close pencil tolerance. Semi-circular, clear PVC plastic, .09" thick, die-stamped graduations 1/2 degrees. 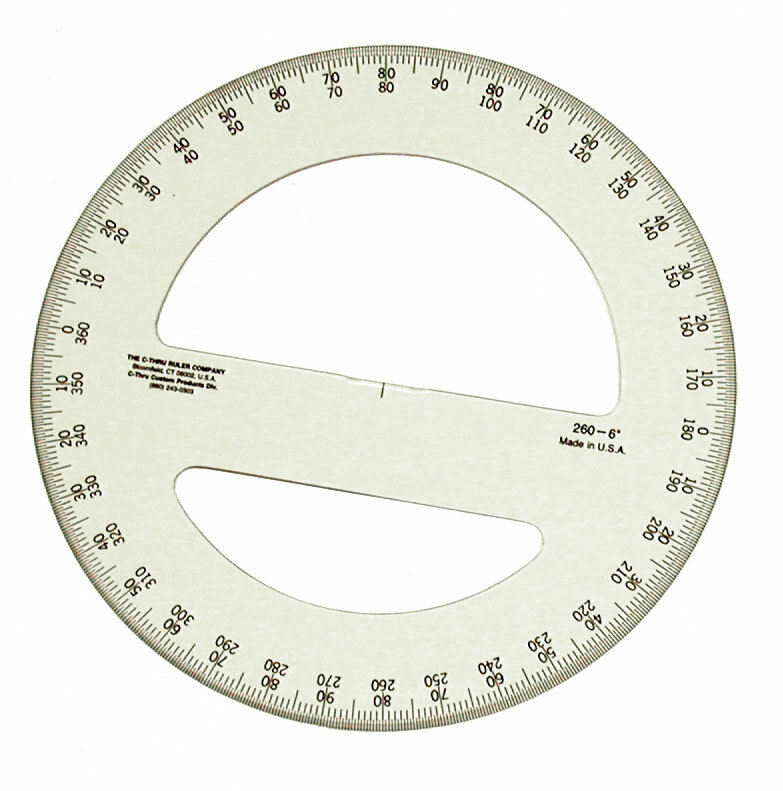 360 DEGREE PROTRACTORS Clear PVC plastic, .09" thick, die-stamped graduations 1/2 degrees. 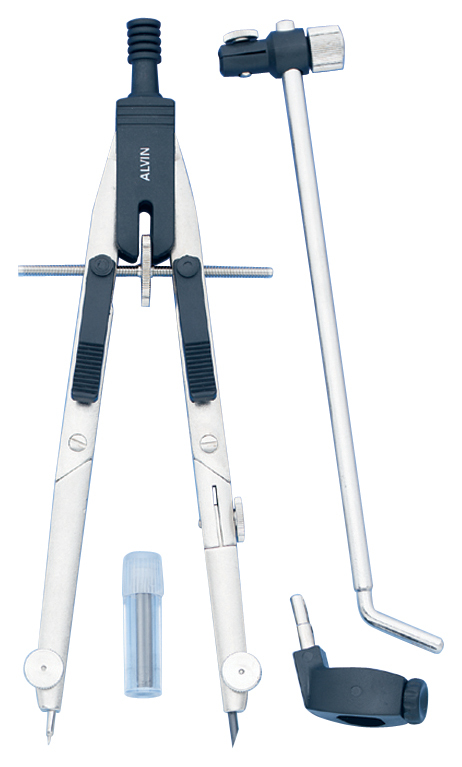 An easy to use instrument that combines the functions of a parallel straightedge, triangle, protractor, T-square and compass in one. Double acrylic blade with printed graduations. Through holes at 1/2" increments for drawing circles. 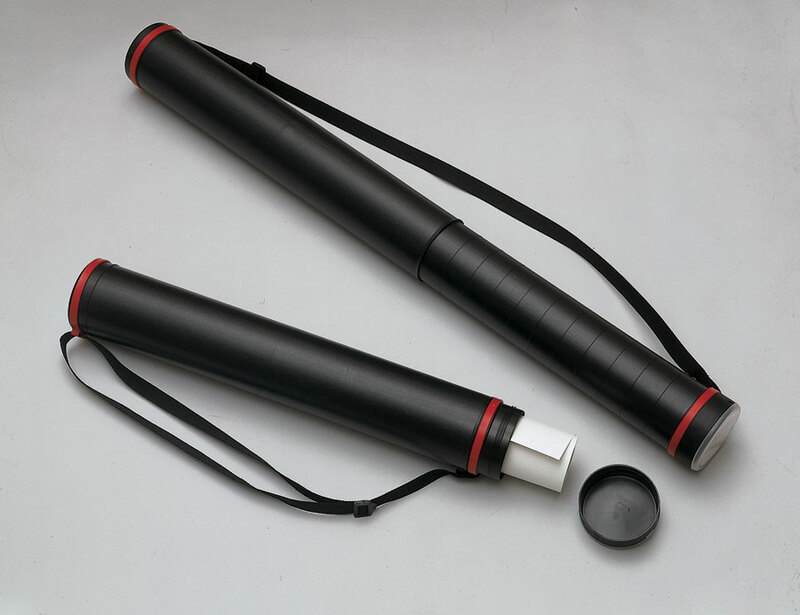 Comfortable aluminum roller bar with non-skid rubber 'O' rings for a firm grip on any surface. 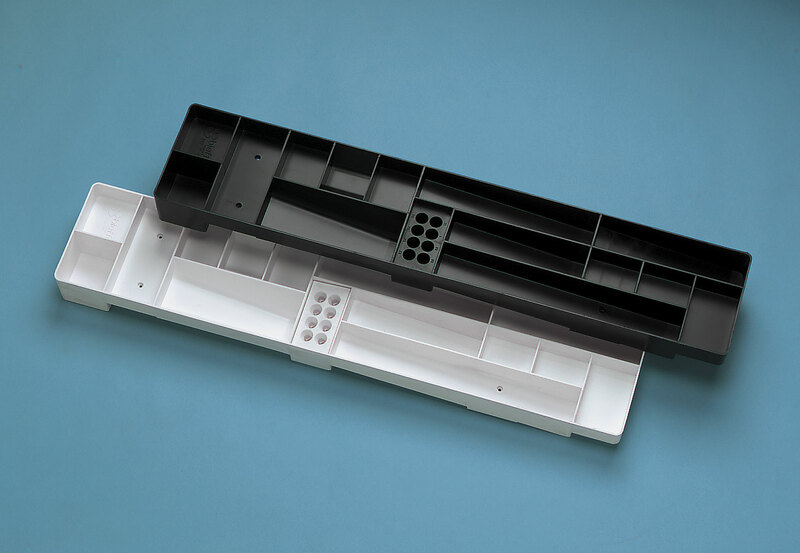 A multi-purpose drawing tool made from high-impact plastic for students, artists and designers. 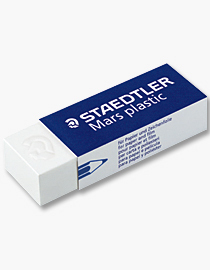 VINYL ERASERS Staedtler soft white erasers for removing graphite marks cleanly from paper, vellum and drafting film. RUBBER ERASERS Soft, pliable pink rubber pencil erasers, bevelled at both edges. 101FC-Large...Box of 12...$16.00 DRAFTING POWDER Finely ground white compound that prevents dust, dirt and smudges from being ground into the drafting media. Powdered gum erasers in a mesh fabric. Gently removes dirt and smudges from drawings. 3 1/2 oz. 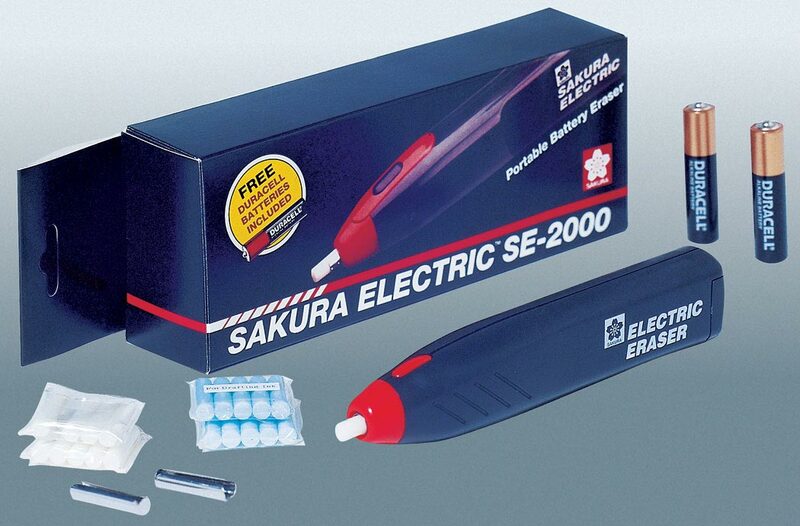 ERASING MACHINE Lightweight, portable, compact, battery-operated electric eraser has an impressive 12,000 rpm strong, torque motor that is built to last. Comfortable hand contour with sleek design, it weighs only 2.6 oz. and can fit in a back pocket. Comes with two AAA batteries, 20 white erasers for pencil lead, and two eraser chucks. Color black. Choice of 12 different shapes. 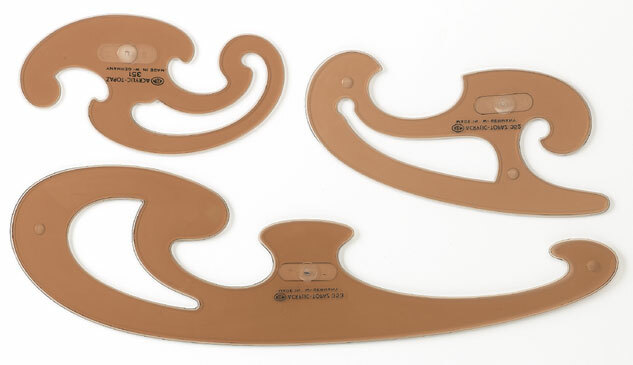 1010-25/17 1/2"....$12.60 FRENCH CURVE SETS Contains selection of popular curves. 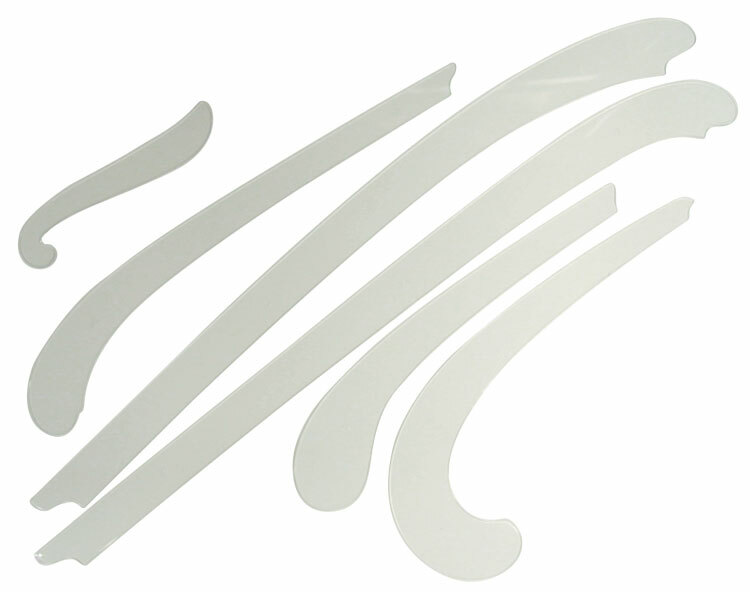 Set of 6 Clear Acrylic ship curves from 6 1/2" to 24". 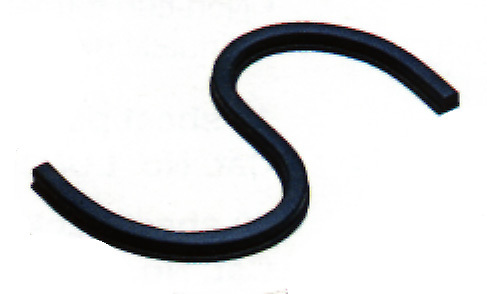 SC66A....$50.40 FLEXIBLE CURVES Lead core with plastic casing, for drawing or measuring irregular curves. DRAWING PENCILS High quality pencils for drafting, drawing and sketching. Will not crumble or dust. 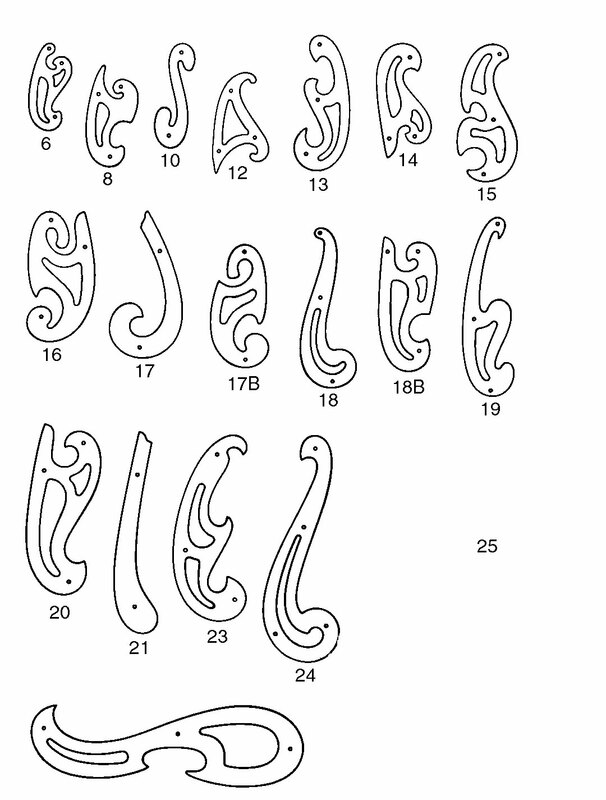 Smear resistant lines with excellent reproduction qualities. Available in 16 degrees 8B to 6H. In boxes of 12. DRAWING PENCILS Durable, non-porous leads. Available in 6B to 9H. DRAWING PENCILS High quality pencils for drafting, drawing and sketching. Will not crumble or dust. Smear resistant lines with excellent reproduction qualities. Available in 9 degrees 2B to 6H. Boxes of 12. 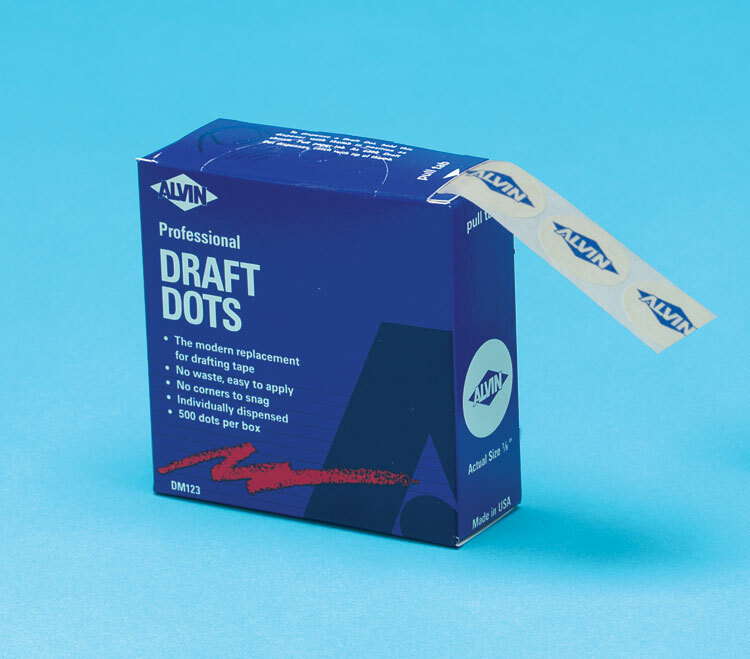 DRAFTING DOTS Contains 500 drafting dots, each 7/8"diameter. In pull-tab dispenser. each 3/8" x 1 1/2". 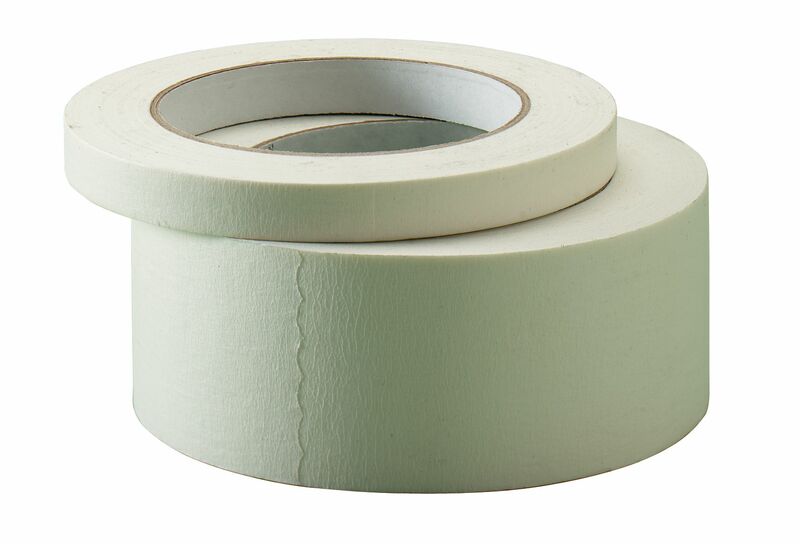 General purpose tape provides firm hold yet releases cleanly. 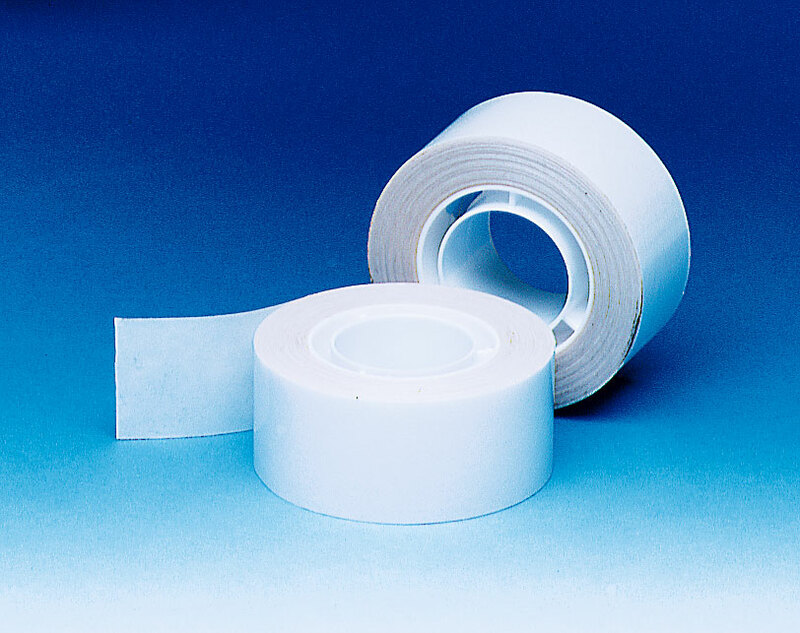 For attaching vinyl board cover, and other general purposes. MARS 2MM LEAD HOLDER Professional quality holds 2mm leads. MARS LUMOGRAPH 2mm LEADS Professional quality leads, grades 4B,2B,B,HB,H,2H,4H. 2MM COLORED LEADS Tray of 12. DRAFTSMAN 2MM LEAD HOLDER Draftsman series professional quality lead holder. makes smooth, uniform, needle-sharp points. Pentel Premium Quality Professional Fineline mechanical pencil. Pentel fineline leads for automatic drafting pencils. 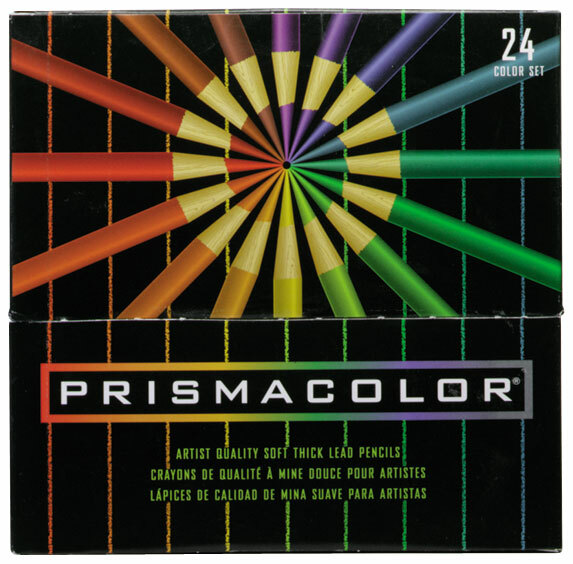 PRISMACOLOR COLORED PENCILS Thick soft leads made with permanent pigments. Water resistant and exremely light-fast. TECHNICAL PENS Available individually with stainless steel drawing points in dual-designated line widths, refillable see through ink cartridge that can be used on drafting film, vellum or tracing paper. An extremely versatile waterproof drawing ink for use on paper, film and cloth. It is free flowing, fast drying with permanent adhesion, yet is easily eraseable from drafting film. Available in blue, red, opaque white and high-opacity black india. 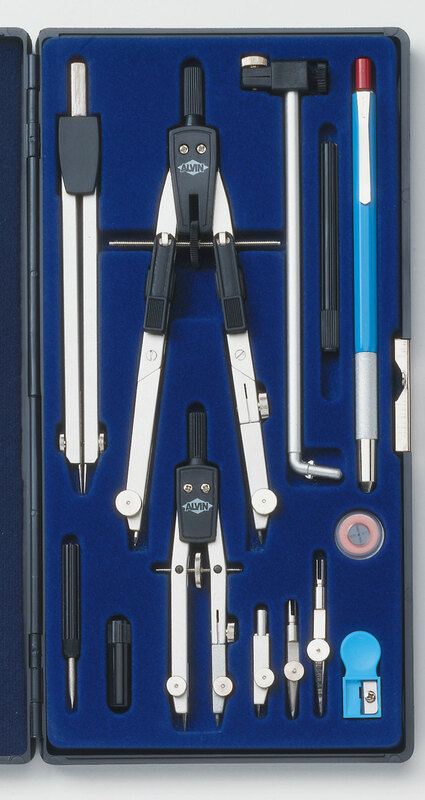 RAPIDOGRAPH PEN SETS Sets provide storage for technical pens in a convenient hinged-lid case with pushbutton release. Seven pen set includes one each of 0.25/3x0, 0.30/00, 0.35/0, 0.50/1, 0.60/2, 0.80/3, 1.20/4. 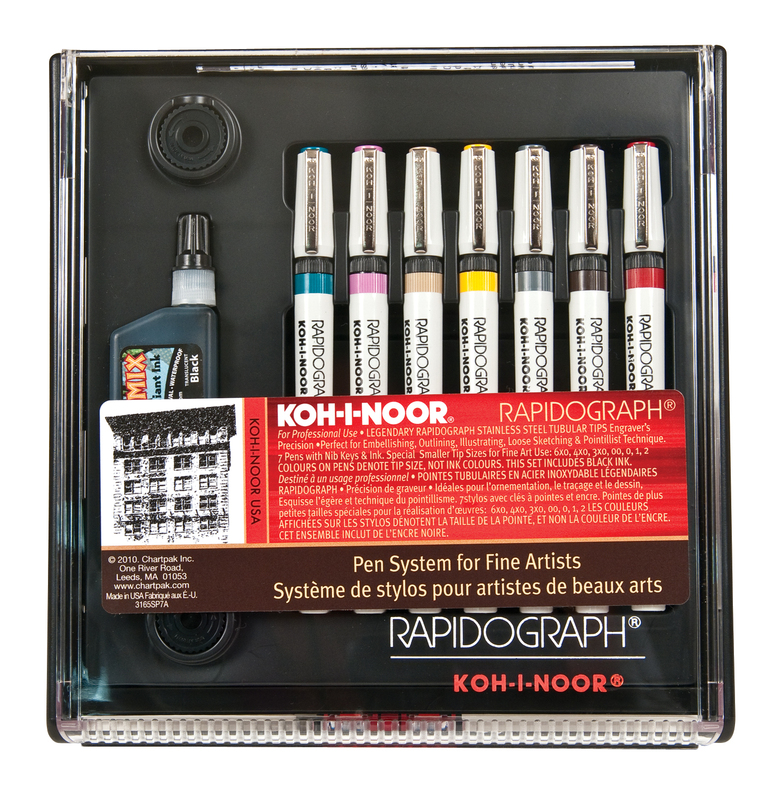 Includes bottle of Koh-i-noor waterproof black india drawing ink and nib keys. Four pen set includes one each of 0.30/00, 0.35/0, 0.50/1, 0.60/2, and universal ink. 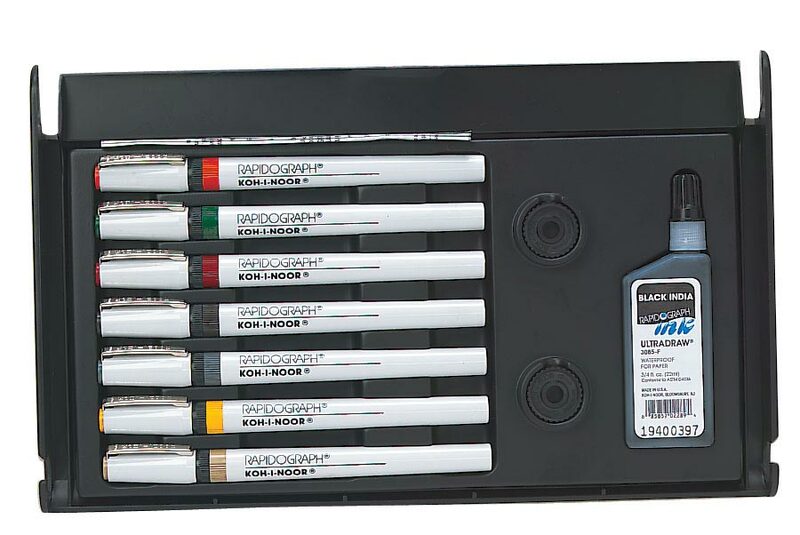 7 PEN ARTIST SET A versatile technical pen for use with all Koh-I-Noor inks. Point sizes range from very fine to very broad for a loose sketching style or a finely detailed pointillist technique. Seven pen set includes one each of 0.13/6x0, 0.18/4x0, 0.25/3x0, 0.30/00, 0.35/0, 0.50/1, 0.60/2. Includes bottle of Koh-i-noor ink. In a high quality clear faced case. and 2 oz jar of Rapido-eze pen cleaning solution. triangular scales. Ideal for scholastic and vocational use. 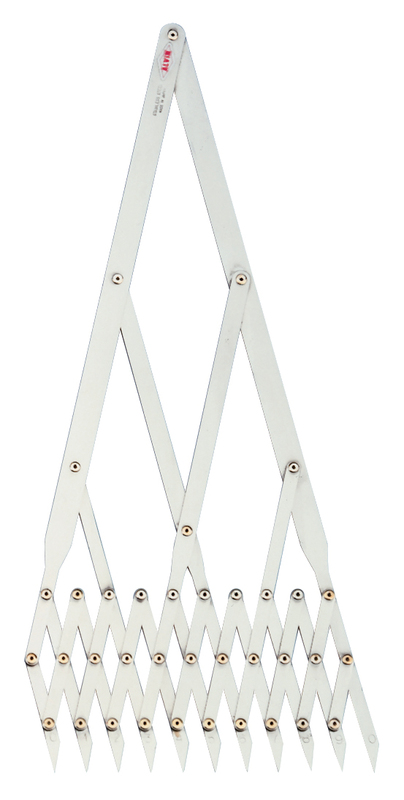 TRIANGULAR SCALES Professional high quality anodized aluminum. 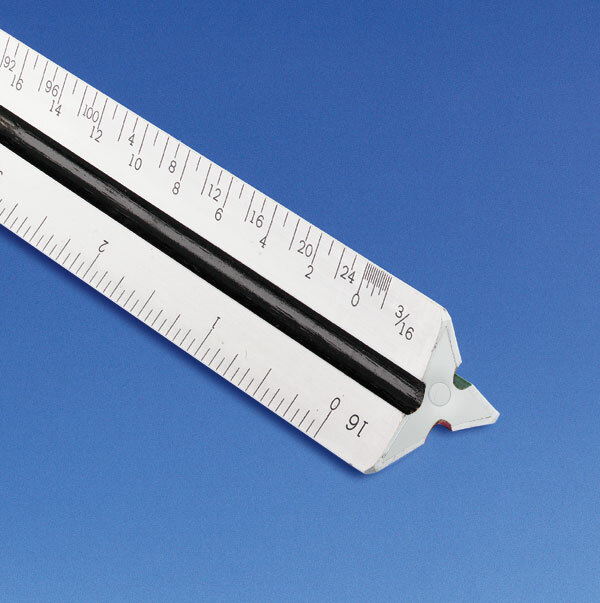 DRAFTING SCALES Four-bevel white scales made of high impact white plastic. Printed Graduations. 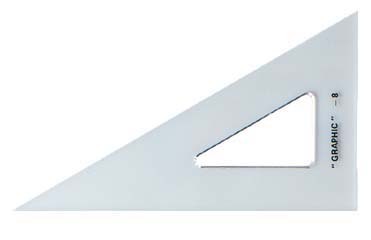 DRAFTING SCALES Four-bevel white scales made of high impact white plastic. Printed Graduations. In vinyl sheath. 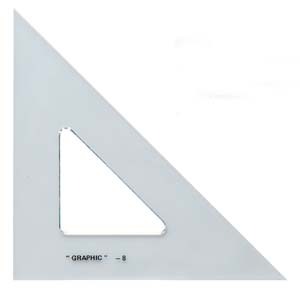 FLAT DRAFTING SCALES Two-bevel high impact white plastic. Engine divided graduations. 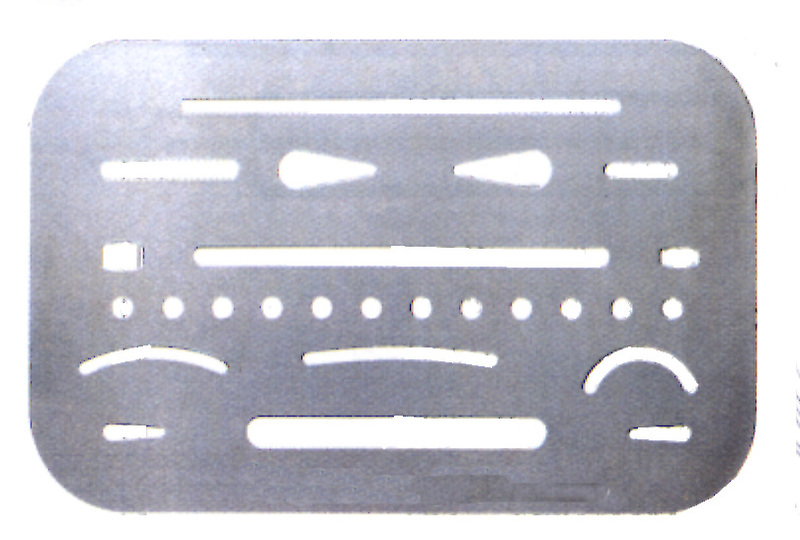 FLAT DRAFTING SCALES Four-bevel white scales made of high impact white plastic. SPEED COMPASS 6" Combination compass, leads. 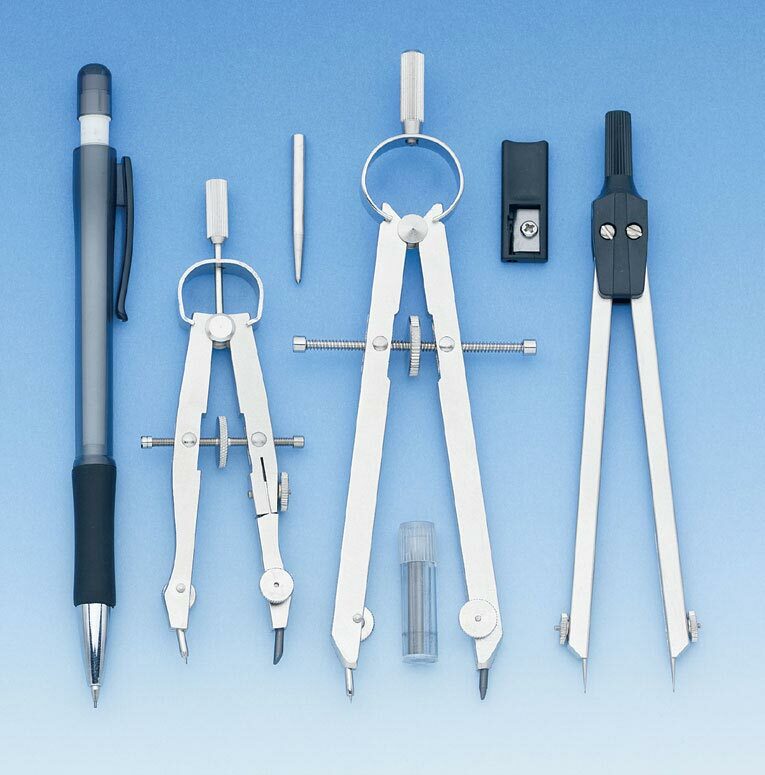 Hinged leg compass, extension bar, technical pen adaptor, leads. 6" JET BOW INSTRUMENT SET Rapid adjustment hinged leg compass. allows a 48" diameter circle to be drawn. Includes pen, pencil and divider legs. Nickel plated with tool steel nib. Hardened steel needle points,matte chrome finish. In velvet lined case. Lightweight duraluminum. Replaceable steel needle points. TRANSPARENT EDGE TEE SQUARES Made of selected hardwood to offer strength and rigidity to the blade. Durable, see-through acrylic edges are elevated to prevent smudging and eliminate surface scratches. 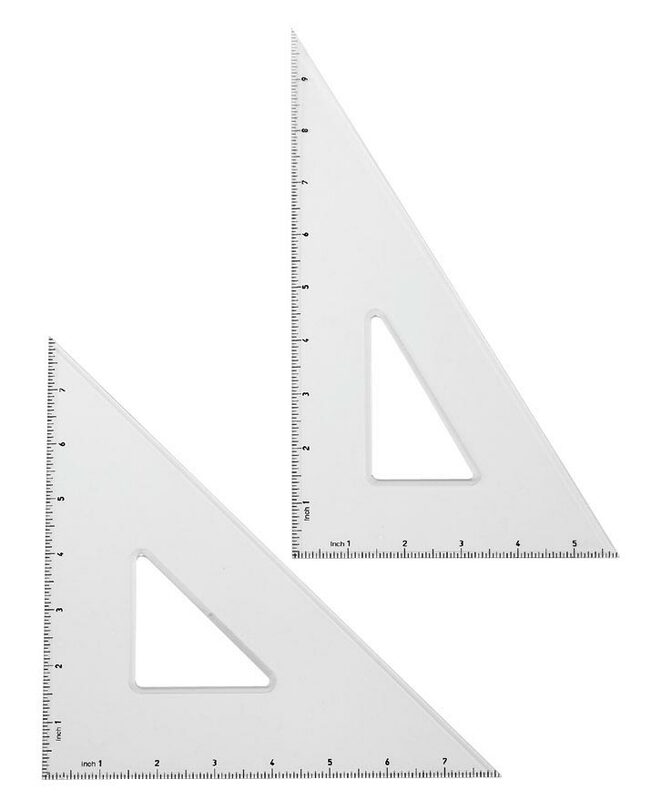 L36......36"..........$33.60 WOOD ACADEMIC TEE SQUARES 1 1/2" wide graduated aluminum blade with strong plastic head. Graduated in 16ths. on both sides. STAINLESS STEEL TEE SQUARES Professional quality. 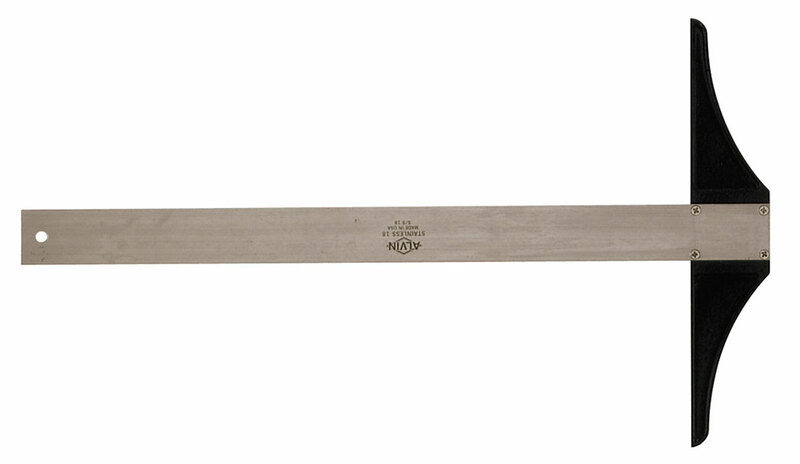 1 1/2" wide spring-tempered stainless steel blade. Aluminum head. ALL PLASTIC TEE SQUARES A full view is provided through the 100% acrylic blade. Raised edge for ink drawing. 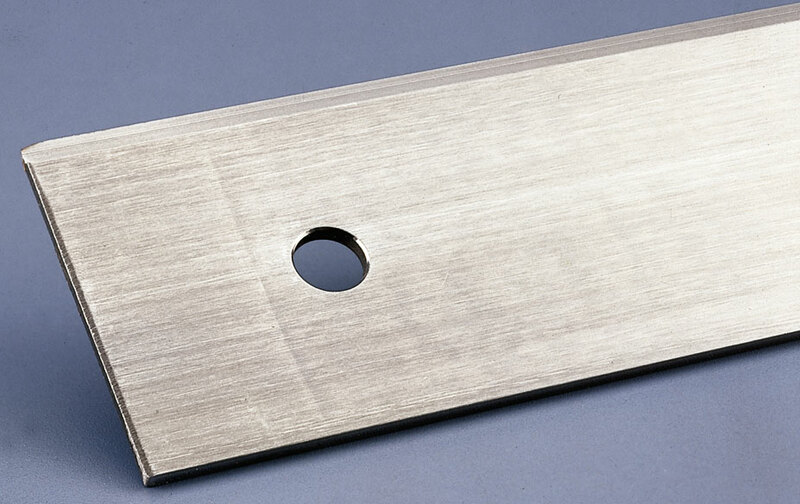 GRADUATED STAINLESS TEE SQUARES Professional quality. 1 1/2" wide spring-tempered stainless steel blade. Calibrated in 8ths and 16ths. Aluminum head. 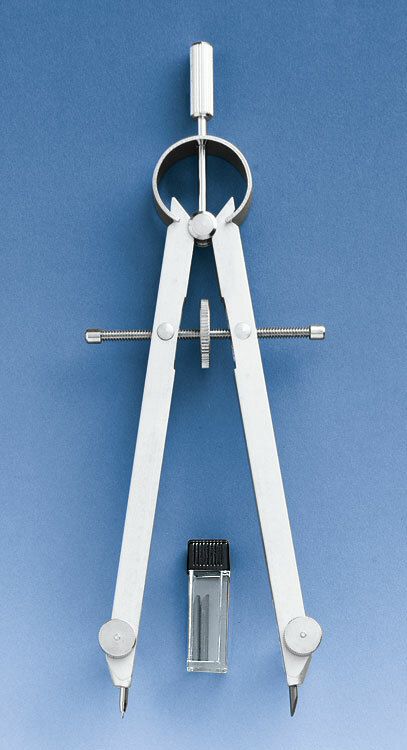 6" compass, 6" divider, 8"-45 degree and 10" - 60 degree triangles, 180 deg. protractor, french curve, erasing shield, selected triangular scale, in vinyl case. 6" bow pencil compass and divider. 16" x 21" drawing board with metal edges. 21" transparent edge tee square. 6" 45 degree, and 8" 30/60 degree triangles. 2H and 4H pencils, sharpener. 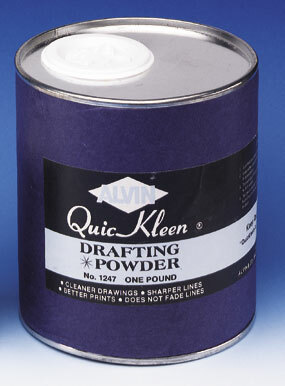 3/4" x 10yd roll of drafting tape. 7" x 5" practice cross section pad. 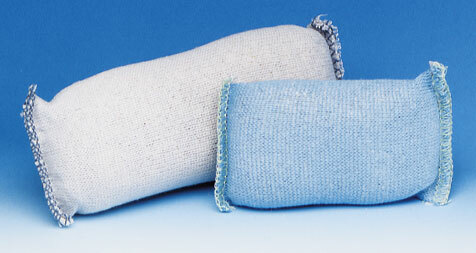 Soft sided carrying case with a short handle and shoulder strap. 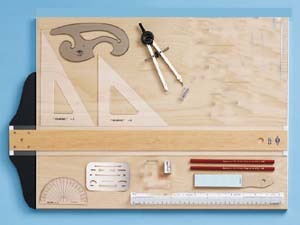 SD404......$205.80 DRAWING BOARD KIT White Melamine 20" x 15" drawing board, wooden tee square, 30/60 degree triangle, 45/90 triangle. 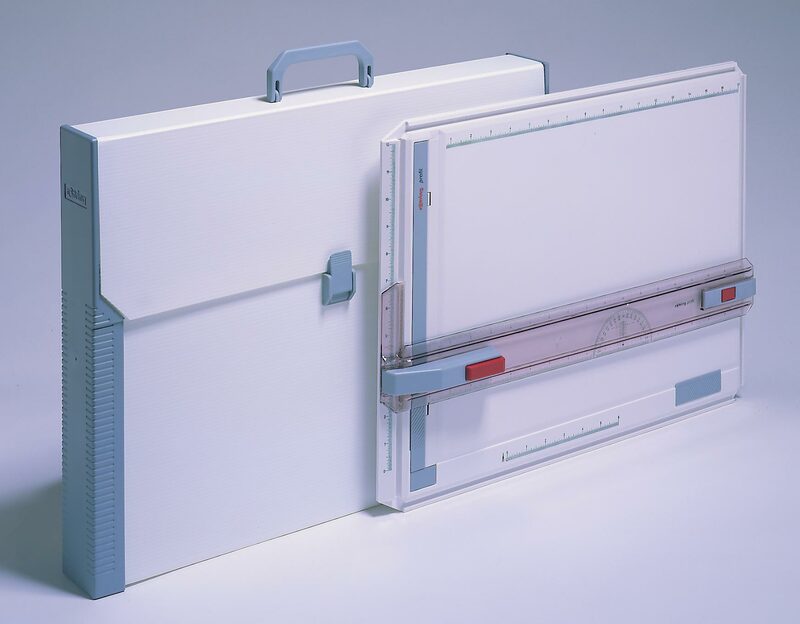 DRAWING BOARD WITH CASE Size 14 3/4" x 19 1/2" for paper size 11" x 17". Graduated in inches along top and sides. Paper clamps in three areas to secure paper. triangle set, protractor and paper. 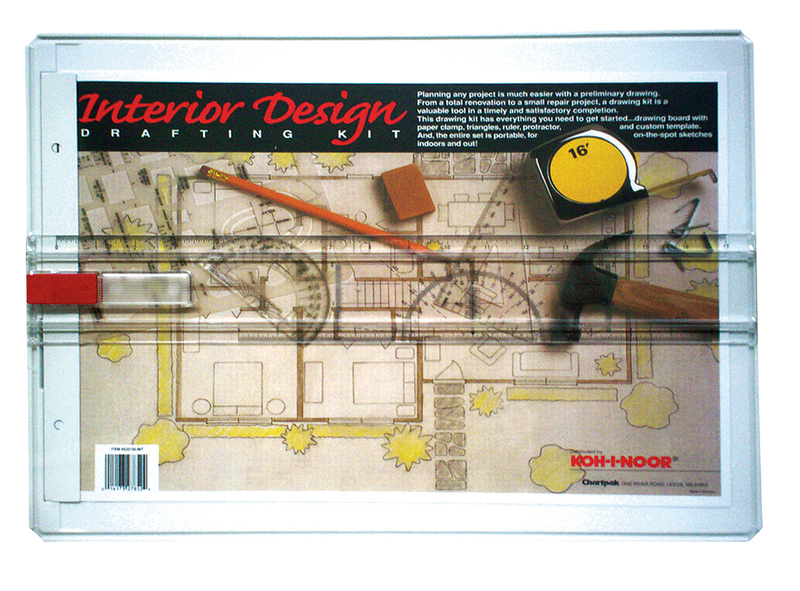 522130INT - Drafting Kit.......$100.00 each. 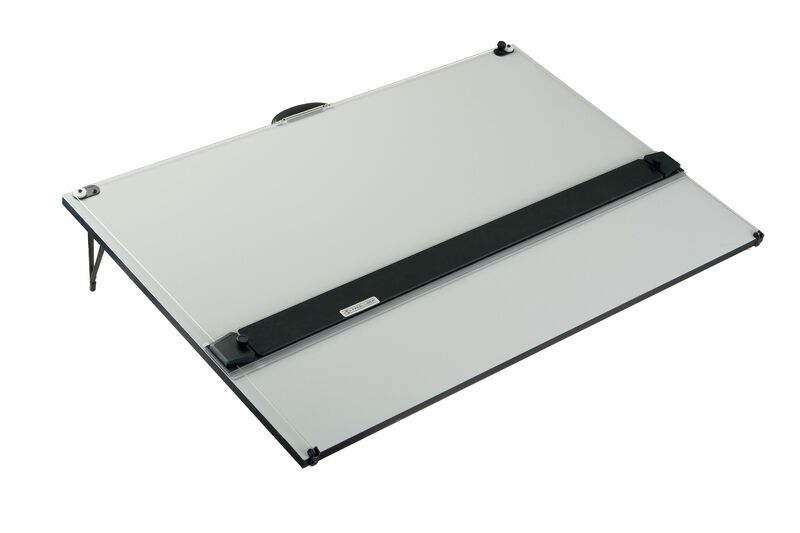 Features the Paraliner phenolic straightedge mounted on warp-free melamine faced board, and fitted with vinyl board cover, foldaway carrying handle and non-slip rubber feet. Compact portable unit. Aluminum straightedge with rubberized grip. Board is warp-free melamine, foldaway legs. 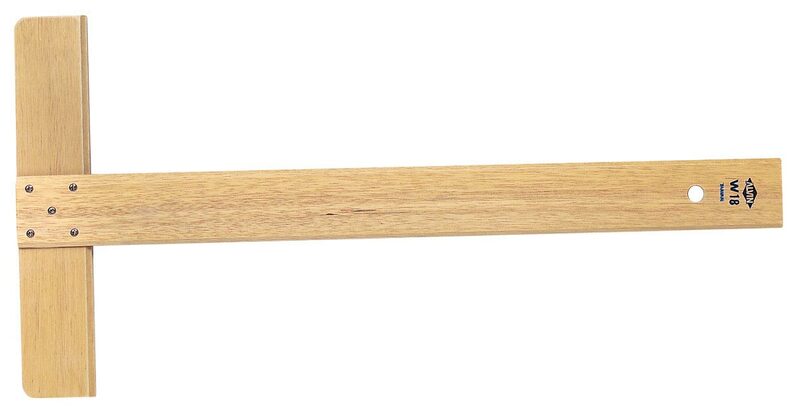 Acrylic straightedge, carrying handle. 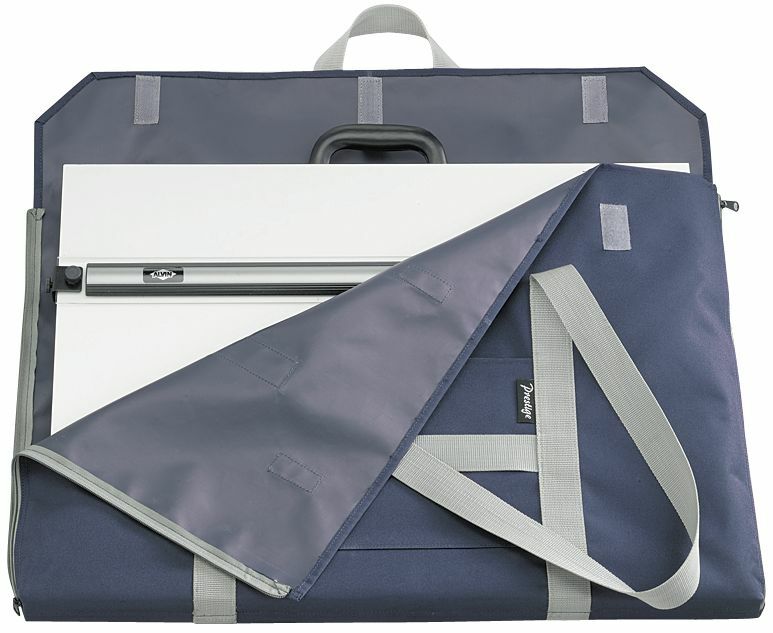 Durable nylon with side zippers and velcro fasteners at top. 7 1/2" x 9" outside pocket. 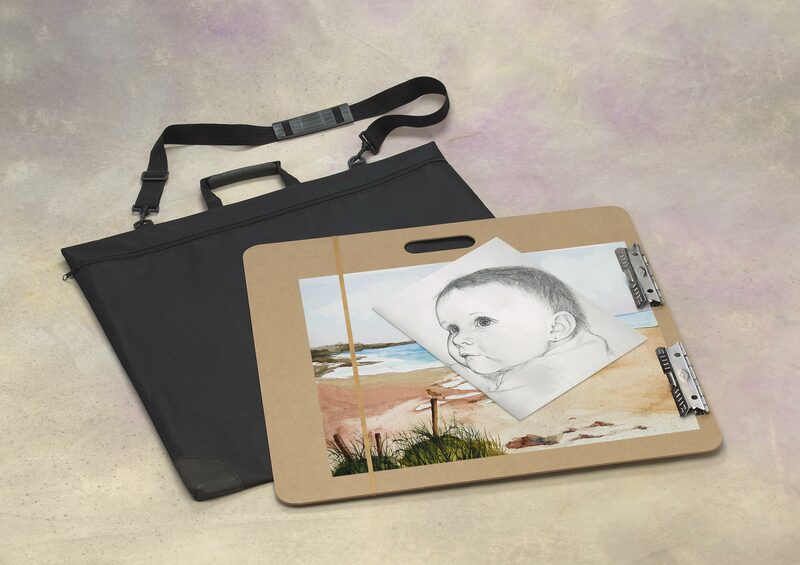 PORTABLE DRAWING BOARDS Solid core, white Melamine face, smooth finish. 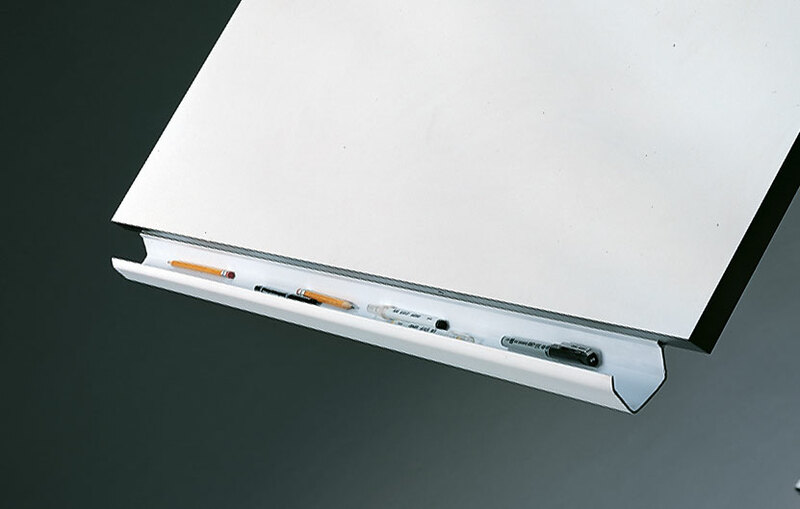 PORTABLE DRAWING BOARDS Ultra lightweight boards, unfinished wood veneer surfaces, aluminum side edges,hollow honeycomb interior. Solid wood edges and center cross frame for strength and rigidity. 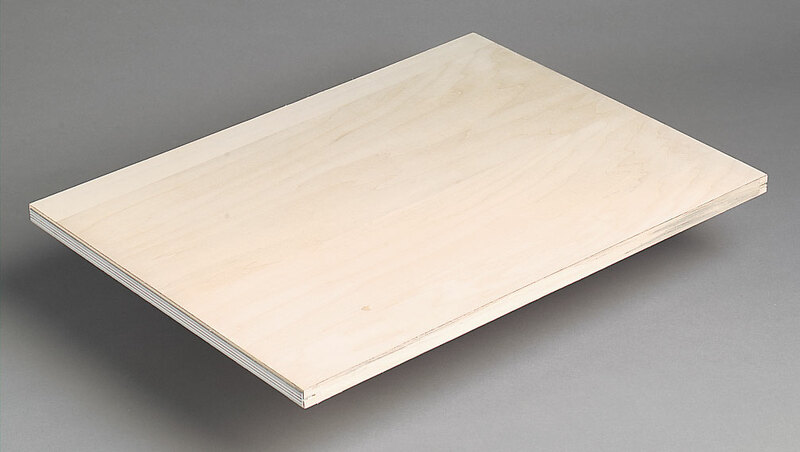 DRAWING TABLE TOPS White Melamine faced smooth finish, 3/4" solid core drawing boards. Black vinyl edges. 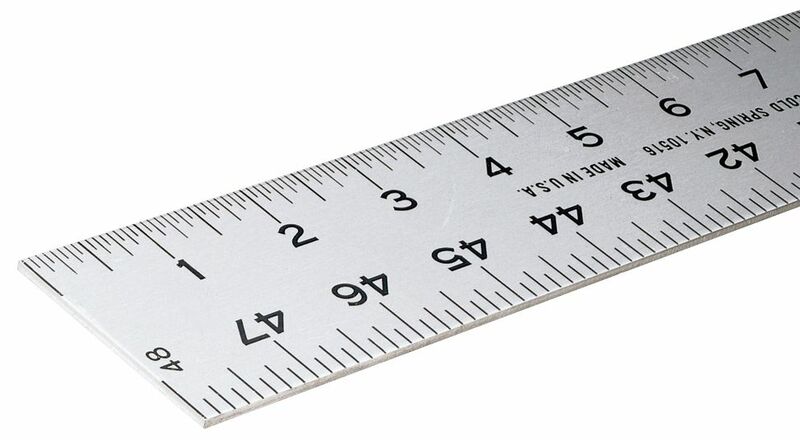 2" wide x .093" thick. STAINLESS STEEL RULES Finest quality stainless steel with non-skid cork backing. 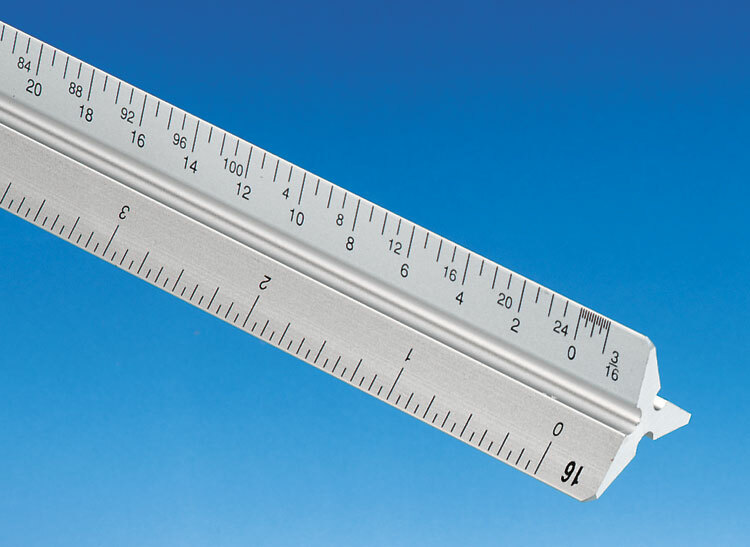 The perfect tool for taking scaled measurements from blueprints, maps and plans.Select the built-in scale factor to match the plan, roll the Planwheel and the measurement is displayed instantly. Features 111 built-in and and thousands of available user-defined scale factors. Includes Imperial and metric scales. 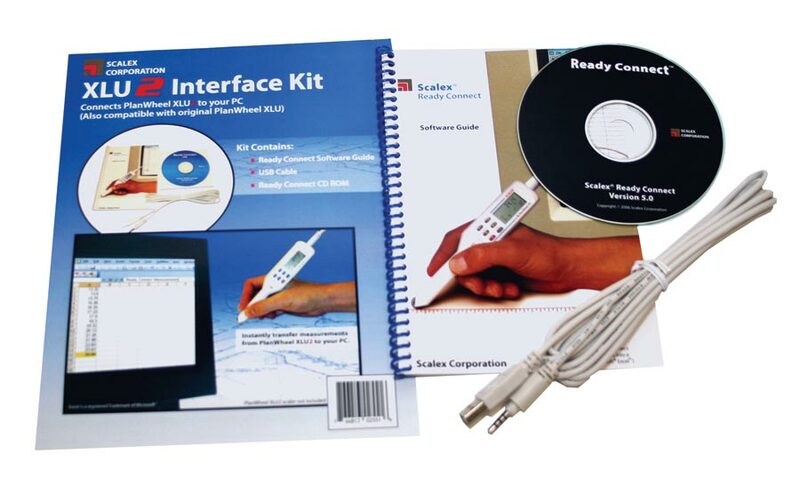 Connects to any Windows application with XLU2 Interface Kit. 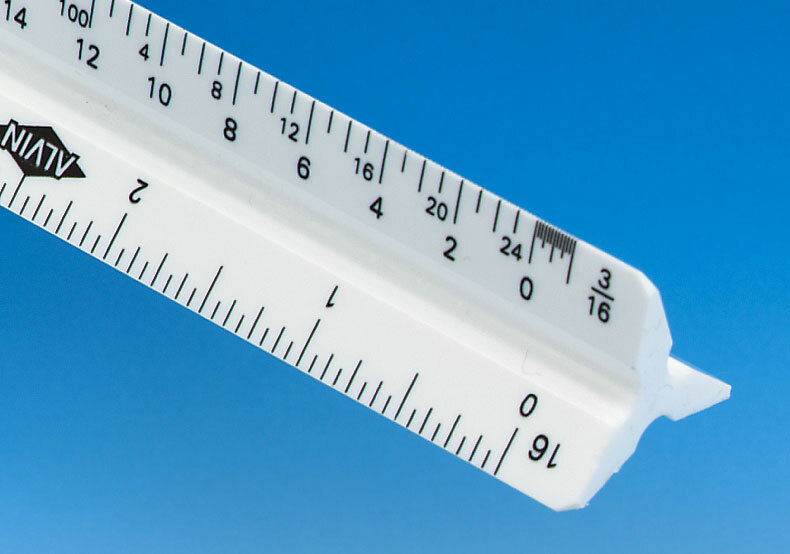 The perfect tool for taking scaled measurements from blueprints, maps and plans. Select the built-in scale factor to match the plan, roll the Planwheel and the measurement is displayed instantly. Features 111 built-in and and thousands of available user-defined scale factors. Includes Imperial and metric scales. CANNOT BE INTERFACED WITH A COMPUTER. Durable, versatile, easy-to-install, 5-ply vinyl cover manufactured specifically for protection of heavily used surfaces. 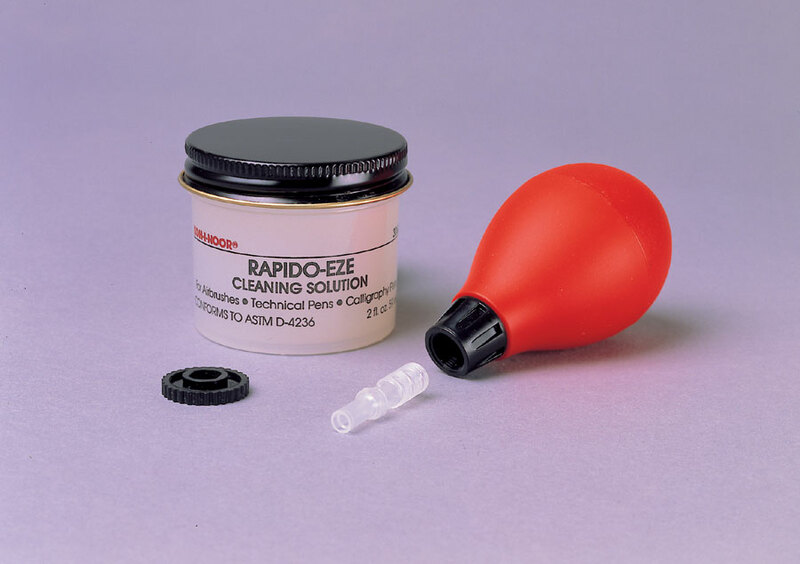 The perfect, smooth stain-residtant working surface for all drawing boards, tables, desks. Self-sealing surface recovers almost immediately from compass points, tacks, hard-pencil impressions. 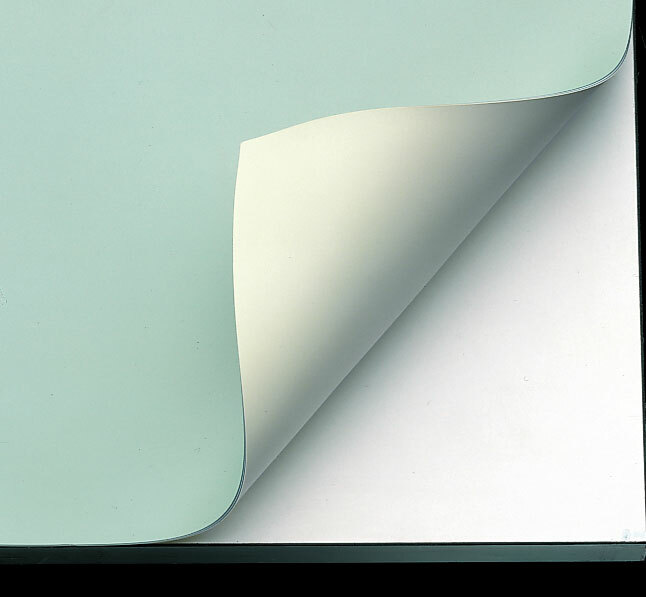 Translucent board cover is ideal for use with lightboxes, or protecting fine wood or glass-topped furniture, and for use as a protector over graph paper, drawings etc. Will not deteriorate, discolor or crack. Cuts to size easily with ordinary scissors. 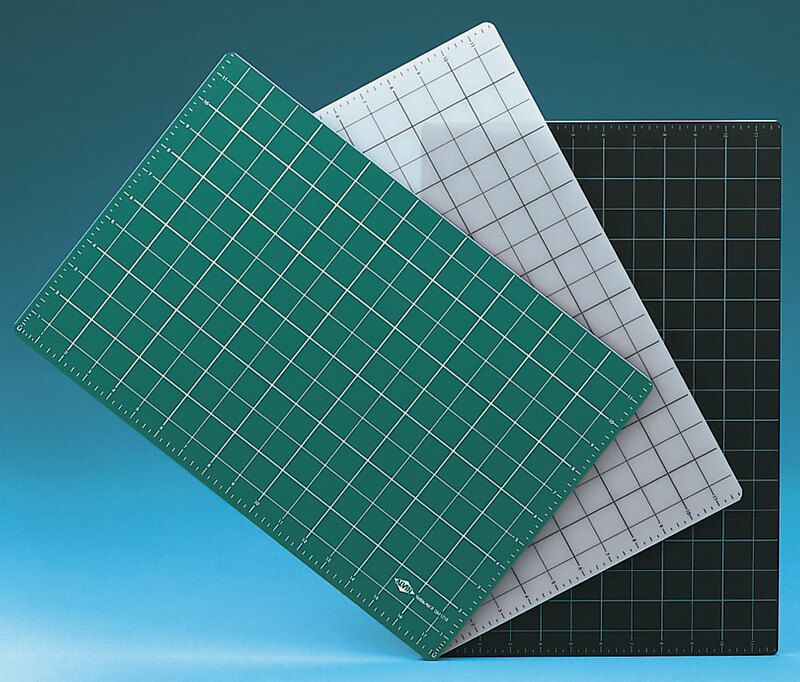 Professional quality for all kinds of graphic arts, hobby, craft, shop and industrial applications, these self-healing and reversible cutting mats are 3mm thick and extra durable. 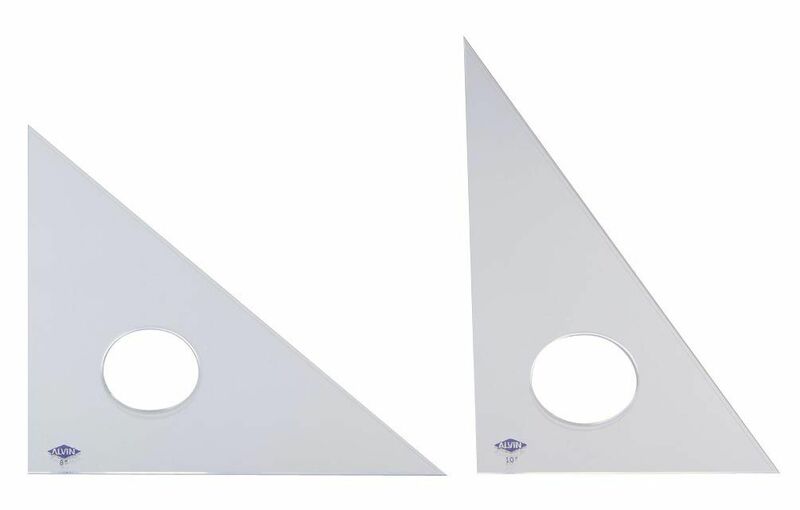 Made from unique composite vinyl material designed for both rotary blades and straight utility blades, they provide a long-lasting, non-glare, surfact that can be cut and slashed constantly without showing marks or cutting lines. Can also be used as a desk blotter or general-purpose work mat. Printed grid pattern includes guide lines for 45" and 60" angles and 1/2" grid lines. Find the perfect center on any project with zero centering lines. All four edges are fully numbered and graduated with 1/8" hash marks that extend beyond the zero base line for convenience. Mat sizes 24" X 36" and above include internal horizontal and vertical graduated hash marks. Non-stick surface is impervious to abrasions and liquid spills. 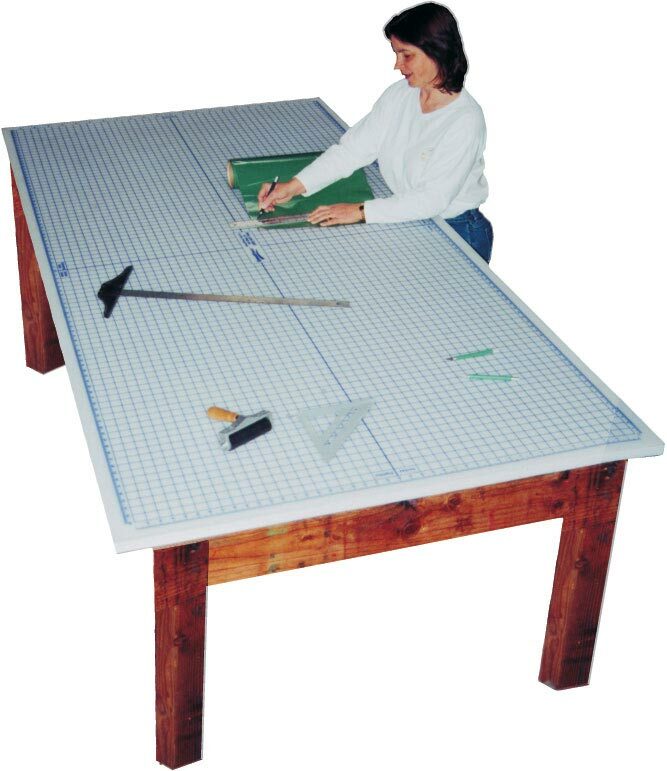 Cutting Mats will protect table top surfaces from knife cuts. The smooth surface permits straight even cutting, and the cut heals instantly. Each mat is printed with both 1/2" and 1" grid patterns on both sides to aid in measuring and aligning work. Green on one side, black on other side. 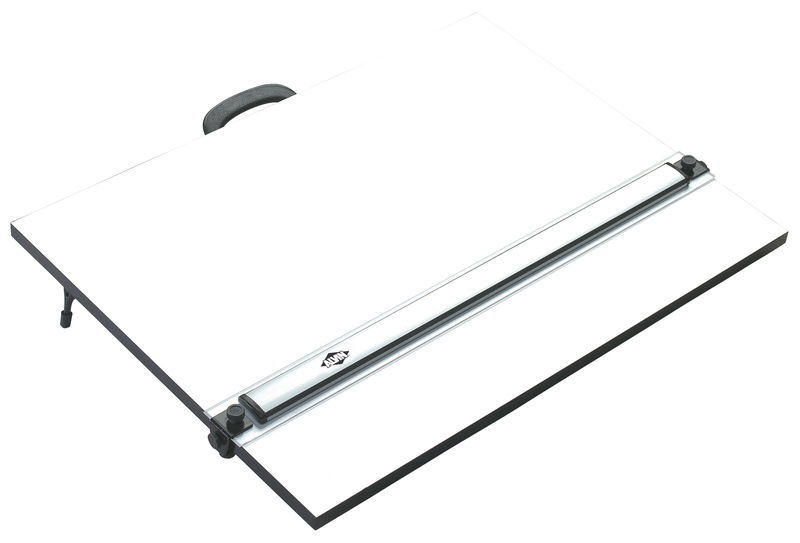 Protect table tops from the sharpness of blades with this 160 gauge (5/32") protective mat. 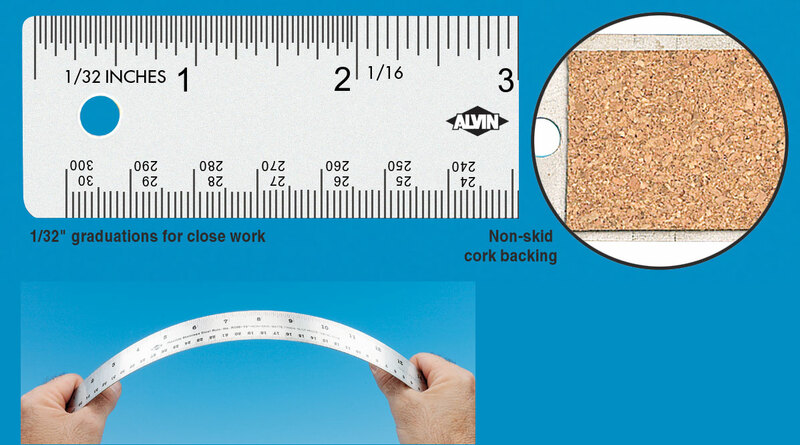 Permits easier and straighter cuts with the aid of the alignment grid and centering rulers. 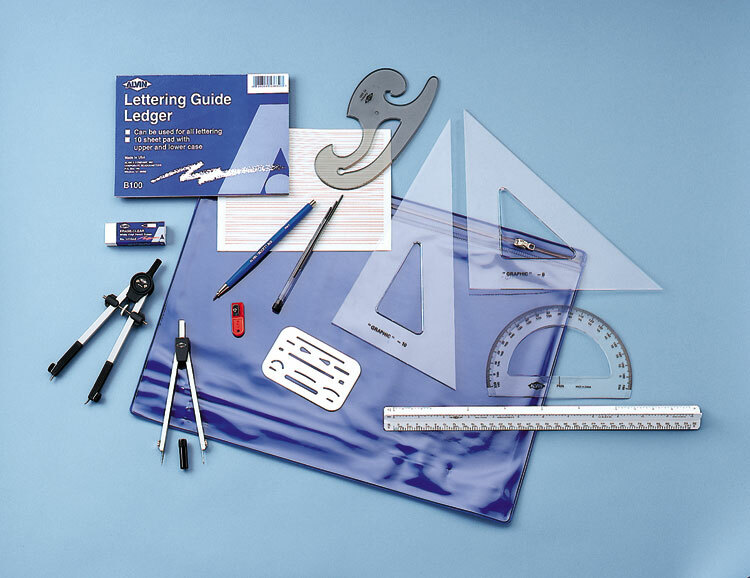 The translucent non-glare surface is perfect for signmakers, designers, hobby, crafts and model presentations. DRAFTING TABLE STORAGE TRAYS Keeps work surface clear. Mounts easily to side of board to hold instruments, pens, markers etc. PLASTIC PENCIL TRAYS High impact plastic. Mounts easily to front of board. Keeps pencils and instruments from rolling off drawing board. 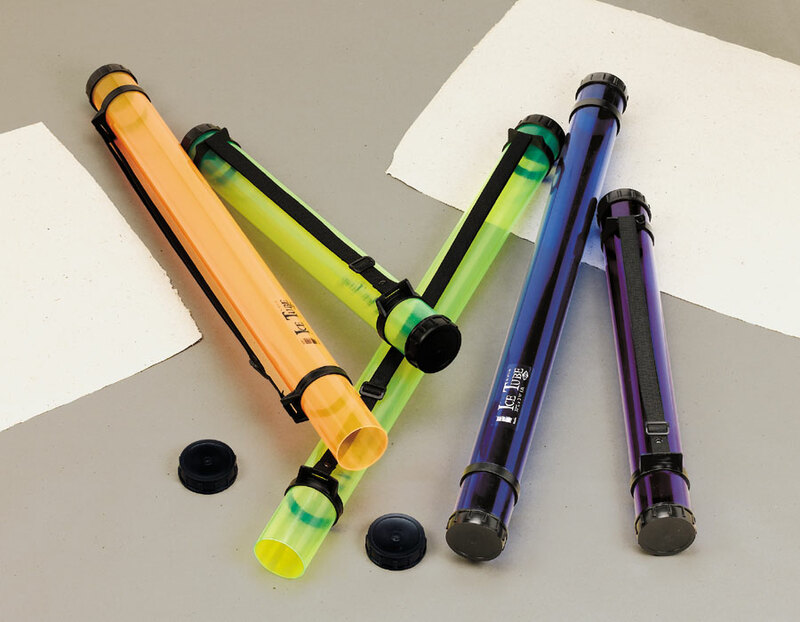 TELESCOPING DOCUMENT TUBE For storage, transporting and protection of documents, artwork, prints and posters. 4 1/4" dia. Extends from 26" to 43. PVC STORAGE TUBES Safe moisture-proof storage or mailing when using these transparent PVC plastic tubes. Adjustable shoulder strap. Choice of Orange, Lime, Blue, Purple. 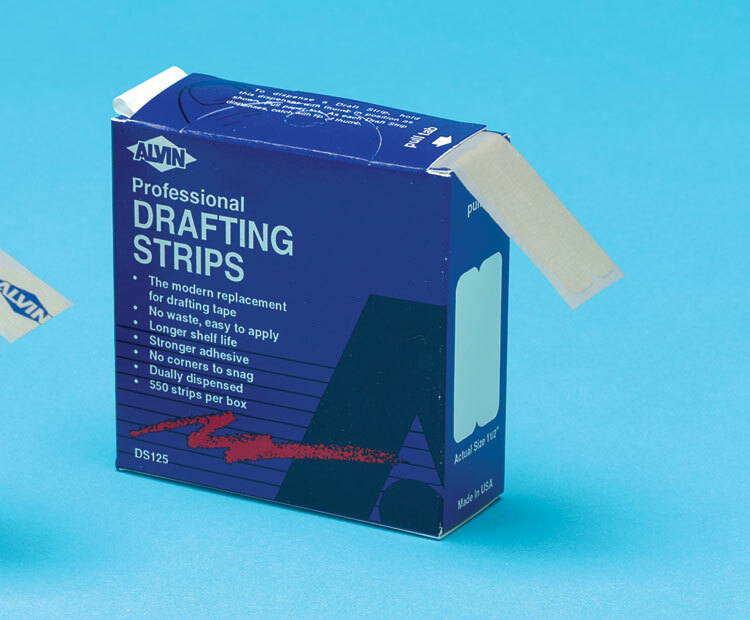 An easy to use system that protects important drawings and documents by applying a protective tape edging. 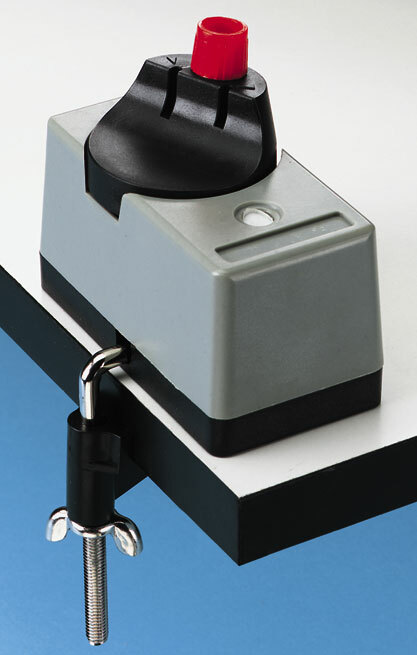 Made of high impact plastic, the EBM5100 clamps onto any table or work surface. For use with the EBM5100. 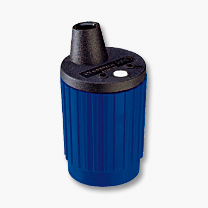 Made from tear-proof PVC material that protects and color-codes valuable drawings and documents. 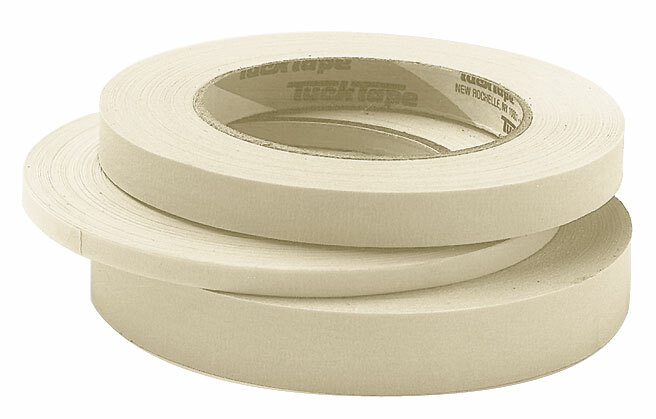 Rolls are 1/2" wide by 80 feet long and have a core size of 1 3/8". Each color packaged and sold in boxes of 10.